Thousands of yuan spent. Hours of studying. Multiple exams per year. And suddenly, the examination prep center is shut down. On March 18, the Shuimu Longhua Preparation School in Beijing’s northwestern Haidian district declared that it would close its doors this week due to “expired qualifications.” It had one of the most competitive extracurricular class packages available, and was one of the only ways primary school children could ensure a spot in the prestigious “experimental class” at the Tsinghua University Affiliated High School. However, “expired qualifications” was not the real reason for the shutdown. According to a Feb. 27 punishment notice issued by the Haidian government, Shuimu Longhua was shut down for “disorderly management of private schools, which has adverse social impact.” After resisting the Ministry of Education’s broader crackdown on extracurricular studies, underway since 2013, the school’s closure could indicate that the government is really getting serious about “relieving the burden” on students. Shuimu Longhua has been shut down before, last year. At that time, Yang Dongping, director of the 21st Century Education Research Institute at the Beijing Institute of Technology, wrote that the center was a “black hole that must be removed” and a major problem. The closure gave people hope that the elementary education system would really see some reform — but that summer, Shuimu Longhua opened its doors again. The school’s resilience perhaps reflects its importance in a system that it helped create and perpetuate — helping young students gain admission into a prestigious high school and into a class with limited seats. Tsinghua University Affiliated High School, which covers grades seven to 12, is the top-ranked high school in Beijing. Its “experimental class” teaches students at an advanced pace and with some newer teaching methods. Tsinghua University is one of China’s top universities. Shuimu Longhua began by offering after-school classes to help students in fourth grade and above gain admission to the high school and, better yet, the experimental class, but was quickly recognized to be the only way to get in. In short, until very recently, if a child wanted to go to the Tsinghua University high school, he or she had to first go through a tough time at Shuimu Longhua — a process many refer to as “squatting in the pit.” After passing several exams, the winner is admitted to the Tsinghua school. It is a protracted war of money and energy. Shuimu Longhua is not the only such institution — previously, almost every key middle school in Beijing had a corresponding training institute. But with the tightening of Beijing’s education policy, “pit classes” have been banned, leaving Shuimu Longhua as one of the few such institutes left in Haidian district — at least until this week. In 2016, Tsinghua University High School had the highest average entry requirement score on the Haidian District Entrance Examination, a test which students must take to be placed in a secondary school system in the district. It is famous among parents in Beijing. But behind the high test scores is a crazy mechanism to select students with the ability to study hard to make it out of “the pit.” Though its name shows that it is a public school, its admissions process is murky. According to data from the Haidian District Educational Enrollment and Examination Center, the school in 2017 aimed to recruit 220 students, of which 40 spots had already been registered and 19 were students with special talents. It is unknown how the remaining 161 places would be allocated. Choosing to “enter the pit” of Shuimu Longhua seems to be the only way to gain admission, but even this process is highly complicated and difficult. 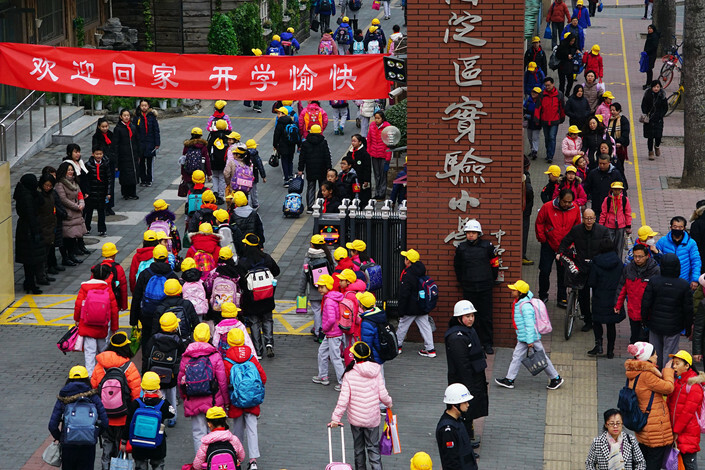 Many parents who are looking for their children to attend Shuimu Longhua have to ask for help from parents whose children previously attended. Caixin found many posts on forums for parents with young students seeking help about Shuimu Longhua. The selection process for the high school can be roughly divided into two steps. First, a student has to pass an enrollment exam to become a student at Shuimu Longhua. Students who have completed third grade can sign up to take the exam, which is offered four times per year. The test itself is said to not be terribly difficult, but more than 30% of students are eliminated. The second step is taking the Haidian district enrollment exam. While students “in the pit” take the exam a few times, those who get the lowest scores are eliminated from the running. Of the hundreds of students at Shuimu Longhua, only the top 80 students each year attain a place in the experimental class at the high school. The process is extremely competitive — and extremely expensive. Prices for one semester of classes at Shuimu Longhua range from 3,000 yuan ($447) to 4,500 yuan or 2,000 yuan to 2,250 yuan during summer and winter vacation periods. In total, fees can amount to between 18,000 yuan to 37,000 yuan for one full year of training, and that doesn’t include any extra classes, pre-exam training, private tutoring or registration fees. Entering “the pit” and failing to take extra classes will cause the student to be kicked out. Students are also expected to attend every class — or risk being eliminated from the running. But Shuimu Longhua doesn’t release a ranking or publicly release all of the exam results. Parents often have to estimate where their child ranks by comparing their kid’s scores to the scores of others. Some parents spend money and are stuck in “the pit” for years without any success. The same announcement indicated that Shuimu Longhua would resume classes after being closed for three months. “Burden reduction” is a buzzword in the education sector in 2019. At the “Two Sessions,” this year’s meeting of the top national legislative and political advisory bodies, Minister of Education Chen Baosheng declared the government’s commitment to shutting down illegal, off-campus schooling: “We will not stop until we have won,” he said. On Feb. 26, 2018, the Ministry of Education, the Ministry of Civil Affairs and four other departments issued a notice forbidding extracurricular training institutions from organizing examinations and competitions for primary and secondary students. It also prohibited “exam-oriented” training activities, such as teaching advanced mathematics or languages. This year, Beijing began to intensify its rectifications. In March, more than 60 extracurricular training institutions in the capital were investigated and punished, and “advanced teaching” and “competition training classes” were suspended. Shuimu Longhua was included. Parents of students attending Shuimu Longhua were divided. Some agreed that the exam prep classes should be banned, especially at such an extortionate price. Others were anxious — how else would they get their children into a good secondary school? For some, it merely reflected the uneven distribution of educational resources. Some say that merely shutting down the prep centers does not fix the problem at hand. “If the gap between famous schools and ordinary schools does not narrow, the extracurricular study industry will always exist,” said Chu Chaohui, a researcher at the Chinese Academy of Educational Sciences. “Relying on distance or zoning will be the main method for deciding what school to go to, but in order to curb school fever and prohibit training institutions from linking up with high schools, the education ministry also needs to provide equal education services,” he said.